This last weekend the 2nd stop of the Mountain States Cup took place in Angel Fire, New Mexico. On a rough, rocky course, Steamboat Springs own Pete Kalmes finished 3rd behind winner Jay Henry and McConnel Franklin. Last year, it was this same exact race where Pete’s form really took off for the season, and looks like it will be the same story this year! Keep an eye out for Pete. The previous weekend, our California resident racer, Ben Portilla also had a great race at the Sierra Cup, near Reno, NV. The Peavine Challenge was just outside of Reno NV. It was hot, dry and windy, with temps in the 90s by the end of the race. The course was entirely exposed, with virtually no shade, with basically all up and then all down in a 12 mile loop, with some high-speed fire roads and some technical descending thrown in, so pretty good for me. The pro/Cat1 field was decent, with a few fast guys I recognized from last year. We started on a windy climb and I quickly glued myself to the rear wheel of the lead rider. He seemed content to keep it steady into the wind, and I was climbing comfortably on his wheel. By the time the course leveled out a bit we were down to four of us in the front. We hit a tailwind section of gradual climbing up a dry stream bed, punctuated by a few technical sections, and I decided I would take over the pace making with the wind at our backs. I didn’t really attack, just kept the pressure on and suddenly realized I was alone off the front. Seeing the gap, I decided I might as well push on up the climb. By the top, I had almost a minute on the two chasers, but with the heat and with a second lap to complete I took no risks on the descent and unfortunately gave up a large portion of my lead by start finish. As soon as the trail tipped up again for the second lap, I slammed some stinger gel, dumped a bottle over my head and pushed the pace hard. The gap grew again, but then I bobbled on a switchback and somehow unclipped and jammed my foot in my front wheel, twisting my ankle. I recovered quickly, but it cost me some of my gap. I pushed to keep some space into the wind to prevent the chasers from using my draft, then punched it into the creek bed again. About half way up the climb, however, the guy who’d been hanging back in third came roaring past me as I was trying to recover from my effort. He timed his effort perfectly, for at any other time in the race I might have been able to go with him. I was in the hurt box, though, so I simply tried to keep him in sight. By the top he had 30+ seconds on me, although the other chaser was dropped for good. I took as many risks as I could on the way down, but the heat and the wind had me cashed and I had to settle for second. Congrats again to both Ben Portilla and Pete Kalmes! Two more races where Honey Stinger/Bontrager riders were at the front. 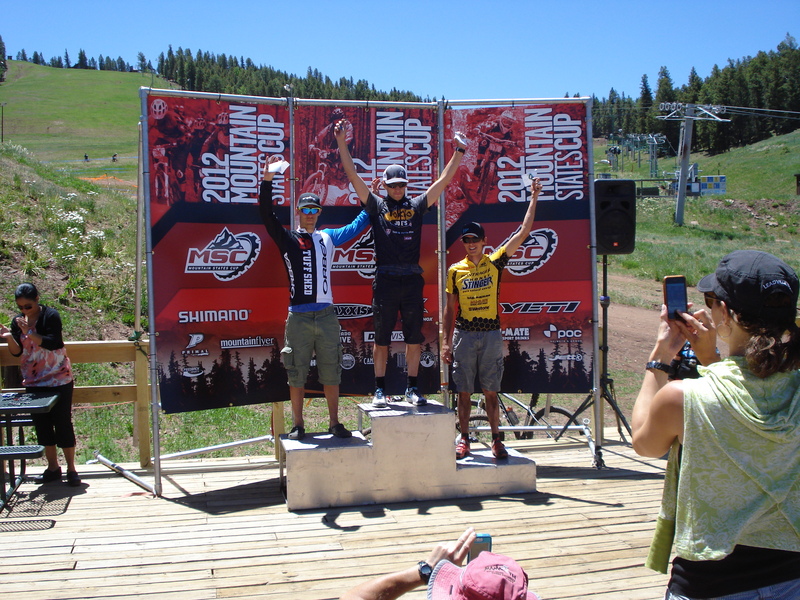 This entry was posted in Team Honey Stinger/Bontrager and tagged Ben Portilla, MSC, Pete Kalmes, Podiums, Race Results, Sierra Cup. Bookmark the permalink.